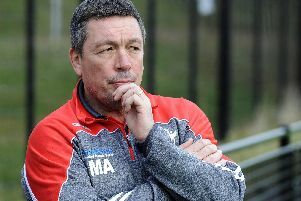 Sheffield Eagles are still seeking to improve their squad with just a week to go until the start of the new season. Director of rugby Mark Aston has looked at four potential recruits on trial during pre-season, and hasn’t ruled out adding new faces to his current 16-man roster. Ex-Wakefield prop Tom McGretton, former Academy graduate and Castleford ace Blake Broadbent, utility forward Max Garcia and experienced former Leeds and Hull star Jordan Tansey have all featured in recent games against Bradford and St. Helens. Simon Brown’s recent departure leaves Aston with a threadbare squad, but the Eagles chief has confirmed he will be boosted each week through the dual-registration deal with St. Helens. That said, Aston is still seeking permanent additions ahead of the Championship opener at Dewsbury. “I am certainly still on the lookout,” he told The Star. Aston remained coy over the prospect of contracts to any of his recent trialists, with Tansey unable to play in the opening pre-season outing due to registration issues. He was given a chance against Saints last Sunday, in a game which also saw a first appearance for new signing Mark Offerdahl. “Offerdahl isn’t where he wants to be so there’s a bit of work to do with him,” he added. “Tansey is still a bit rusty and he’s only been with us for a couple of weeks. “The likes of Blake Broadbent, they are obviously very young, but his Dad (Eagles legend Paul Broadbent) was young when he started and he quickly developed a fine player. I think that Blake possibly has a bit more than his Dad did at this age. We have to keep nurturing him and the others and see if they can handle it. If they can’t handle it, then they might not get enough game time. We’ll have to see. “The run outs were important to see where we are, and for us to make an assessment. The Eagles kick off the 2018 season at the Tetley’s Stadium on Friday 2nd February, kick off 7.45pm.